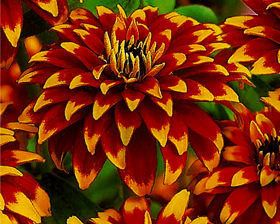 A compact, disease resistant class of zinnias with amazing multi-colored double flowers in mahogany red with contrasting yellow or gold petal-tips. Good for cutting and planting in the middle or front of flower beds. Zinnia will flower all summer until the first frosts, attracting bees and butterflies as well as the admiration of your neighbors! Also good for cuttings. Height 30-40cm. Sow seeds March-May on the surface of a good, free draining, damp, seed compost. Then lightly cover, 3mm deep with vermiculite or compost. Place container in a propagator or seal inside a polythene bag at a temperature of 20-30C. Germination usually takes 7-14 days. Can also be sown direct into the soil after last frost.